BLACKFIRE Interior Detailer 128 oz. Freshen up your interior surfaces in just one application! 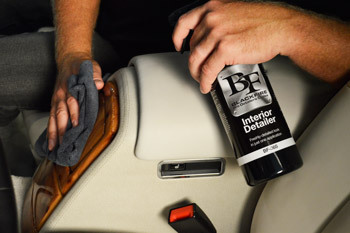 BLACKFIRE Interior Detailer is a quick cleaning and quick protecting interior product designed to save you both time and money. BLACKFIRE Interior Detailer is not meant to replace your standard two-step cleaning and protecting routine, it�s simply used when your interior needs a little sprucing up! BLACKFIRE Interior Detailer will remove dust, fingerprints, and smudges from interior surfaces and leaves behind a low sheen, clean finish that will protect against UV rays � after just one use! Interior cleaning is an unpleasant but necessary evil. Depending on the level of contamination, you could spend hours spraying, scraping, scrubbing, and wiping. Regular maintenance is the key to easy maintenance and BLACKFIRE Interior Detailer is definitely an easy maintenance product! Just as you would use a quick detailer on your paint to freshen up your exterior, you can use BLACKFIRE Interior Detailer to freshen up your interior! 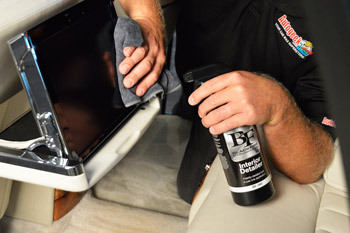 BLACKFIRE Interior detailer can be used on all interior surfaces � including leather, vinyl, plastic, and even LCD navigation and television screens! BLACKFIRE Interior Detailer removes dust, light dirt, fingerprints, smudges and more and is safe for use on all interior surfaces � including leather, vinyl, rubber, plastic, and navigation screens. During cleaning, BLACKFIRE Interior Detailer also leaves behind a layer of protection that guards against UV rays, keeping your interior as new as the day you got your car! BLACKFIRE Interior Detailer is ideal for professional detailers that either don�t have the time to do a strenuous two-step interior detail, or would like to offer a more affordable option for their clients. BLACKFIRE Interior Detailer does, essentially, the work of two products in just one application and lets you move on to the more exciting aspects of detailing. BLACKFIRE Interior Detailer provides that �just detailed� look to your interior surfaces every time it�s used � and if half the time! Shake well. Do not apply to hot surfaces. Spray Interior Detailer onto surface to be cleaned. Using a soft, clean microfiber towel, wipe away dust, dirt, fingerprints, and smudges. Flip to a dry side and buff away excess product. For delicate surfaces and to avoid overspray, spray Interior Detailer onto microfiber towel or pad before application.